I had a whoopee moment on the Walking America site the other day when I ‘landed’ just in front of a road sign. It was the first feature I’d seen after more than sixty miles of uninterrupted tarmac. Honestly, someone has wiped out America and all these messages one gets from nice Americans are place else, probably a call centre in Mumbai. 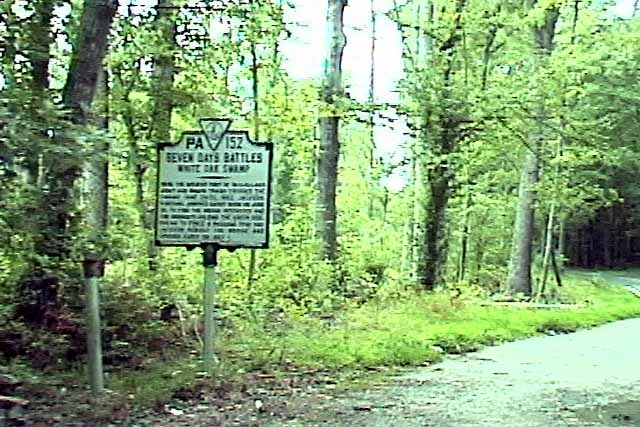 What the sign post says is ‘Seven Days Battles – White Oak Swamp’. Now that sounds interesting. The small print is unreadable but you can find the story of six battles over seven days during the American Civil War on Wikipedia. It’s like a game’s board. You don’t know where you’re going to land with a shake of your pedometer. Currently I have a mailbox in view, thirteen miles short of Mechanicsville. The virtual world has a long way to go to catch up with the real one. Truth, as ever, is much more interesting than fiction. On Thursday I went to London to meet my cousin-from-Canada, Maggie, at the V&A, achieving at least a 1000 paces just crossing Oxford city centre to reach the bus stop. Footwear is a problem, as usual, and I’d opted for comfortable crocs. The V&A is whacky and the visitors can be as interesting as the exhibits, but walking boots in Victoria’s palace? No… And I wasn’t into carrying bags, so I opted for the crocs. Bad choice. Should have gone for the lace-up Ecco’s. Maggie has been in Canada so many years that she’s starved of history. She stood with her eyes swimming just looking at the brickwork of the V&A, but by the time we’d spent half an hour in the medieval gallery, she was overdosing on the past and went looking for twentieth century fashion. She’d brought her friend, the amazingly-named Tracey Lee Farey-jillions. We’re Facebook friends meeting for the first time – much hugging in real time – and within minutes these two are making me laugh until I ache. ‘No, I followed him into the woods, he was definitely exposing himself!’ ‘He may have been just taking a wee.’ ‘Not with that expression on his face.’ I’ve no idea who they were talking about. These two should be discovered by Nick Parks and put to work on Creature Comforts immediately. Scarf by Wolvercotian, hair by Tracey Lee, wall tiles by William Morris. I’d knitted Maggie a scarf. Naturally she looked gorgeous in it. 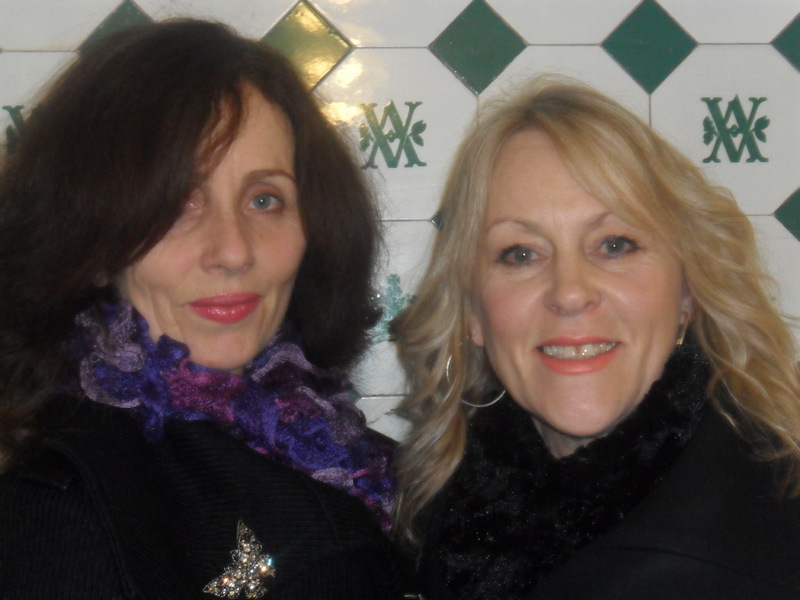 The girls – these two will always be girls, never women and never old – chose to pose in their favourite V&A place, the tiled loo next to the William Morris room. How invigorating it is to be with people excited by what they see. The V&A shot up in my estimation. Actually, it is a blooming good museum. Afterwards we strolled down Knightsbridge to get some air and ended up in Harrods. My mother used to go to London just to visit Harrods and come back with a carrier bag. I could never understand why. Perhaps it’s an age thing, because I really enjoyed myself. This is not a shop and certainly not a department store, but an emporium. Just like the V&A, the settings are as amazing as the exhibits, and the other visitors are worth a squint. Through the halls we went, the bright, sparkling perfumery, up and down the Egyptian escaltor, through the swagged food halls with food so perfect I couldn’t possibly eat it, to the sweet shop where I nearly fainted from the presence of Easter eggs so utterly, utterly amazing that they must surely be as close to the Platonic ideal of Easter eggs as can be. Just the smell nearly carried me off. This place beats Peter Pan’s Playground at Southend’s illuminations, which was the annual highlight of my Essex childhood. And didn’t I grow up, however briefly, to become a maker of grottoes for Santa, however briefly? It was on the Egyptian escalator, underneath some plaster pharoahs and mummies, that Trace got a call from the V&A telling her that she’d left her purse behind and she had ten minutes to get back and pick it up. The dream-bubble burst. The girls rushed off. I was left in a heap of tawdry surrounded by the super-rich – mostly Egyptian and Russian – their wealth betrayed by the look of misery common to all. Oh God, I’ve never seen anyone more miserable, apart from the seriously poor and oppressed. Fancy having so much money that spending it brings no joy. Tough, eh? So, left alone, I walked on to Marble Arch via Hyde Park. It was sunset. The park was full of happy people. A goosey flypast alerted me to the Serpentine and I went back to see the sun set on its waters. 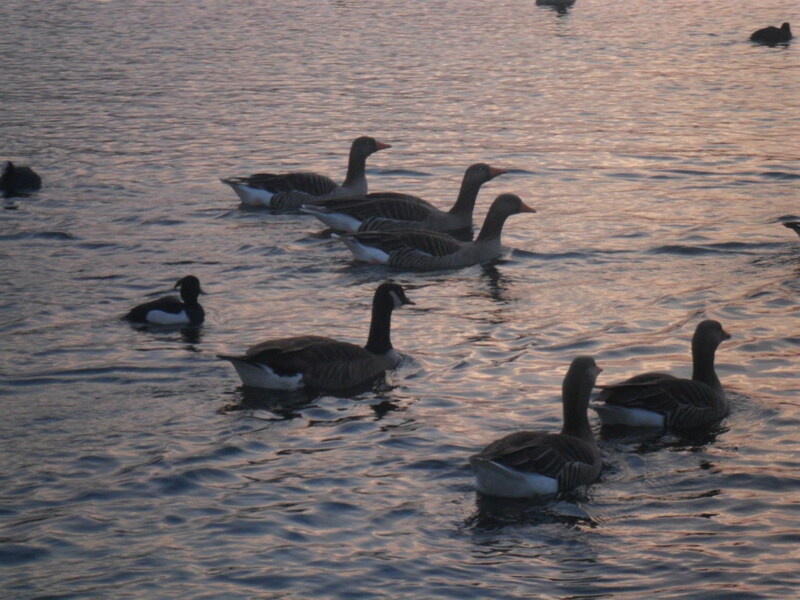 Canada geese, greylags, swans and ducks – these London birds know how to schmooze the visitors, coming out of the water to honk at you in the face. I found them wanton and a bit vulgar. Anyday that combines solo walking, e-america, wild friends and medieval art is a good day!